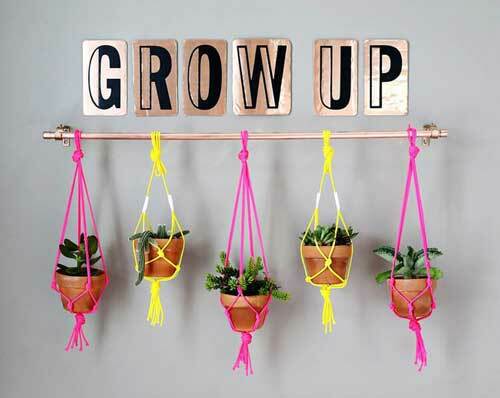 Hanging Garden displays are not only beautiful, they can also be very functional too. 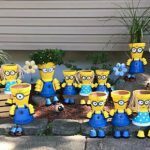 It may be a case that you just love to add color and style to the higher up areas around your home and garden, or it may be that you have an issue with space. Either way, there are many very functional uses as well. 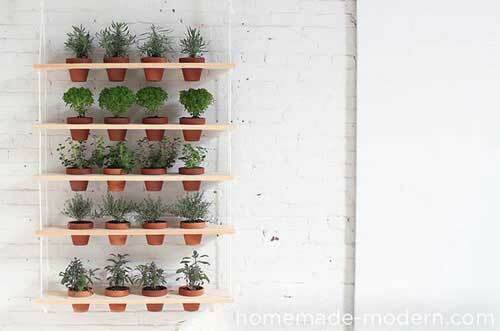 A hanging garden can give you some much needed extra space for growing plants, fruits, vegetables, and herbs. Whilst using less space on the ground. They can be very useful for people with limited mobility. 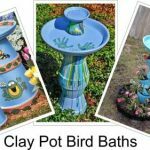 For instance, you could hang your garden at just the right height for a person in a wheelchair, or someone who has limited flexibility. You could use them to create a screening and some privacy. 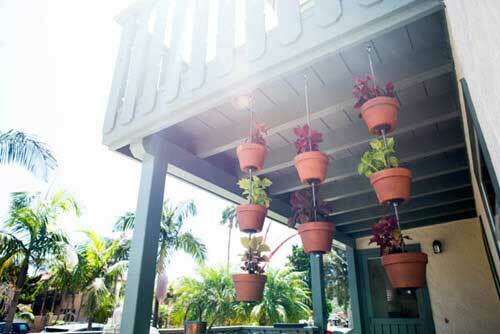 Hanging clay pots in this way can provide a certain amount of shade from the heat of the day. 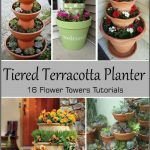 Maybe you have a garden where there is a lot of shade low down and you need to place plants higher up to get more sunlight. 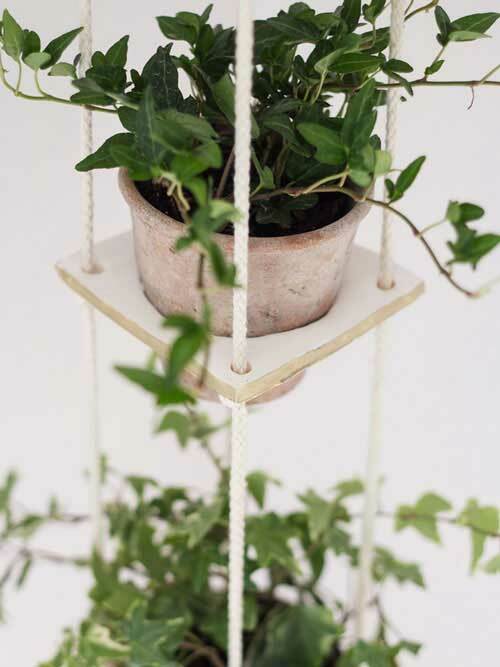 Whatever your reasons, a hanging garden display can be a beautiful focal point for your house or garden. 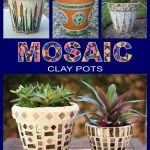 This beautiful planter set is more rigid, it has been put together with a steel rod making it more solid. 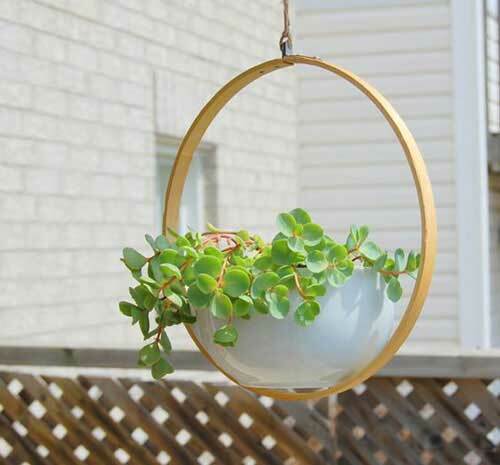 This is perfect for balconies and porches. With its rigid construction, it will be less likely to blow around. However, if you have a high up apartment or just a really windy area, you could easily attach it to the top and the bottom, with only minor adjustments to the process. Making them ideal for just about anywhere. A delightful design featured in the Horticult by Ryan Benoit Des. If you are interested in recreating this project you can get a full and detailed tutorial from the link below the picture. A more fanciful design to brighten up any area. Fun to make and always a talking piece. 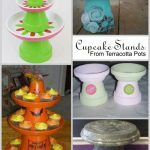 If you like bright colors then maybe this is the project for you, it is a very simple starter project. 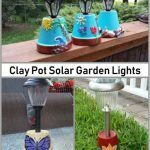 These are ideal for both indoor and outdoor use as they can be hung from virtually anywhere. 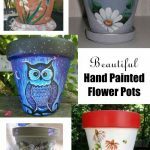 There is a full tutorial over at House Beautiful. 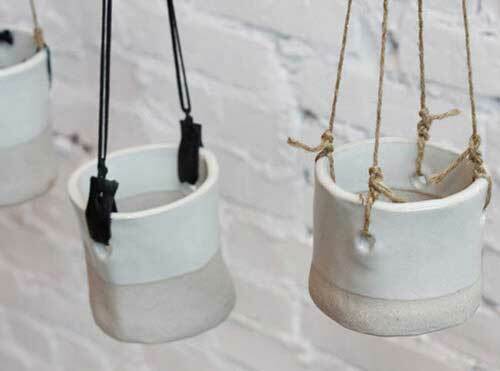 Once you have created your hanging pot, you may be looking for a place to hang it. 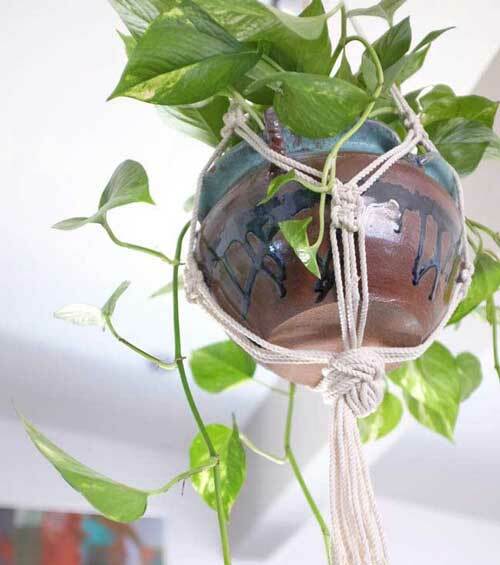 The creator over at a Beautiful Mess has a lovely tutorial on how to set up your copper pipe to hang your pots from. 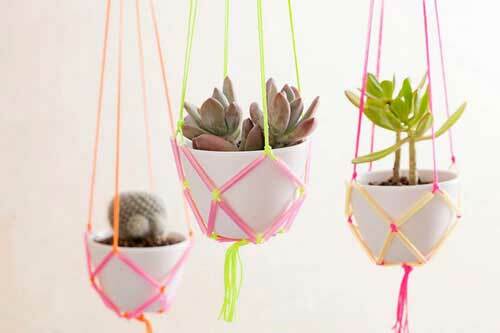 If you not keen on the brightly colored strings you can use whatever materials you please. 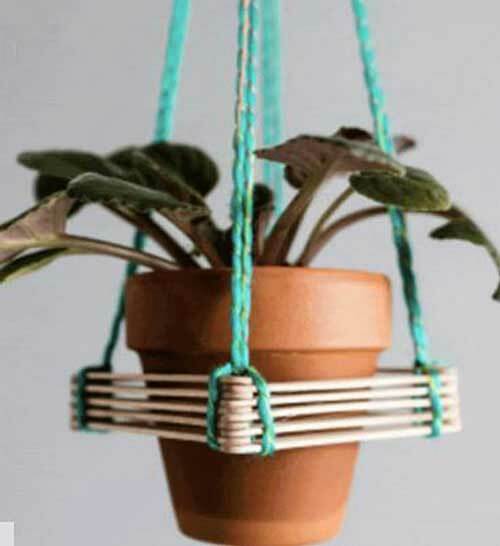 From paracord, garden rope, chains or even macrame. A more structured design of shelves and rope gives an easy way to hang a lot in an organized fashion with only two points of connection above. Made up of flat boards with holes for the pots and connected via rope from one to next, this is altogether a much tidier and efficient use of much needed limited space. 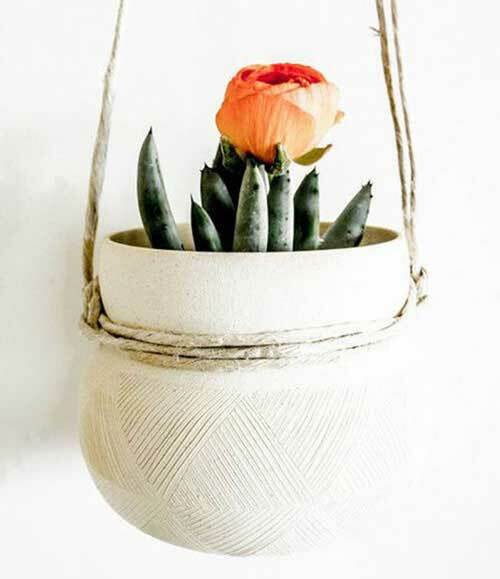 Both elegant and novel this vertical planter is constructed from homemade clay pots, joined with chains. Though elegant, you would not want to use this idea in an area where there is a lot of wind. For a more simplistic natural look, this hanging shelf planter is ideal for any sheltered area. Made up of a simple log slice and suede strips it is an easy beginner project. 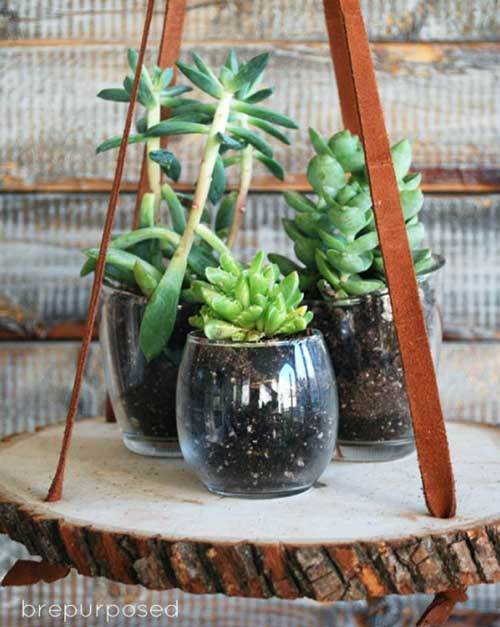 I personally wouldn’t use the glass holders, I would use three different sized clay pots. You have to wonder how the pot stays in place. Visually attractive and delicate. Definitely, a unique and awe-inspiring design. If you want to see how they get the pot to stay in place, go take a look at the tutorial. 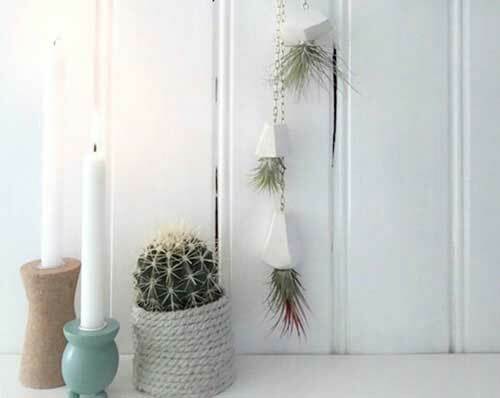 A singular version of the hanging shelf display but with the materials of the geometric planter. 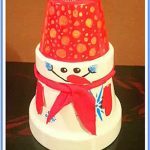 You can make this design using polymer clay to create the square potholder section to fit the pots you have available. Simply rope. To produce this effect you simply wrap some rope around any pot that has a ridge or indented area below the top. Tying it off in any simple secure fashion that you please. Macrame the art of knotting string in decorative geometrical patterns. Save you lolly sticks and have a go at this interesting little project. For this project, you are going to need twenty regular shaped lolly sticks, some glue, and the string of choice. Simply glue together the corners as shown in the picture, alternately stacking the sticks. Then, attach your string as shown. Simples! 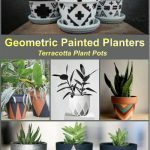 Whether you are using glazed pots as in the picture above or basic terracotta unglazed pots you can easily drill holes to make it easy to hang your pots. 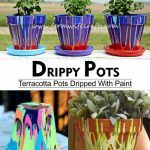 For a full tutorial on how to drill holes in your pots visit Wiki How. 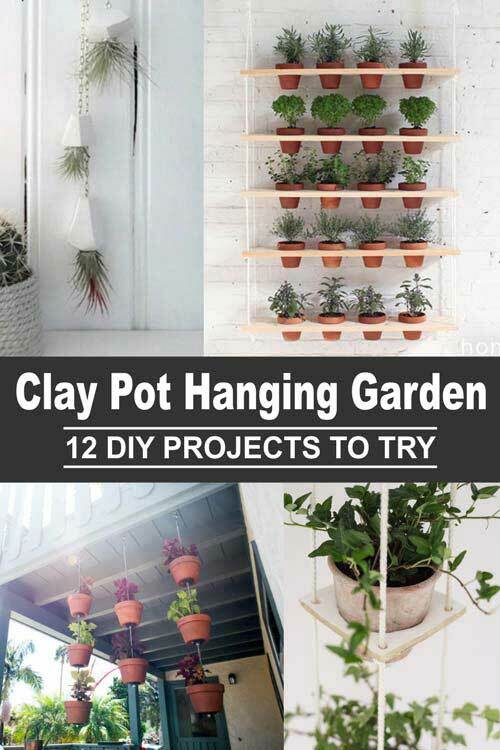 So there you go 12 different and unique ideas for hanging your clay pots and creating a beautiful hanging garden. It’s nearly impossible to find educated people for this subject, but you sound like you know what you’re talking about!